When it comes to products that are suitable for a multitude of outdoor pursuits, there are only a few that are as important as efficient and safe camping stove. But, with the number of camping stoves readily available on the market it can be difficult to choose a stove that will suit your own requirements. You will either pick one that runs perfectly, or be left with one that goes out at the smallest draft of wind. Today, we are going to be reviewing the MSR Pocket Rocket Stove, and several of its own serious MSR competitors. Whether you spend a lot of your time camping, or just want a stove that is suitable for outdoor use, MSR will more than likely manufacture the ideal product for you. They are known for producing lightweight, high-quality camping stoves that are suitable for a number of scenarios. A warm meal can be ideal while out in the cold of the wilderness, and a lot of people that enjoy adventuring in the backcountry use their camping stoves to purify water collected from other water sources. Most official guides, including the one for the famous Appalachian Trail, advise that you always purify water before drinking it. The quickest way to choose a camping stove that is suitable for you is to consider your own needs. By doing that you will know almost immediately whether or not a camping stove is suitable for you, and whether or not it has the capability to manage what you intend on using it for. One thing to always consider is how many people you are cooking for, or how many people you are purifying water for. This is because differently sized camping stoves can handle differently sized pots and pans. 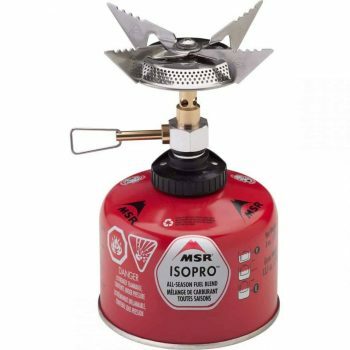 The most lightweight camping stoves are only suitable for one person use at a time, whereas slightly heavier camping stoves like the MSR WindPro II Stove can handle pots up to 10” in diameter. Larger than normal fuel valve, providing easy flame control. So what makes the MSR MicroRocket Stove a worthy purchase among backpackers and campers? Below, we have highlighted some of the key specifications of this stove. These specs should give you a good idea if this outdoor cooking system is right for you or not. Out of the box, you’ll probably be surprised at just how compact and lightweight the MicroRocket is. It comes in a 5 x 3.5 x 4 inches box and weighs only about half a pound. Once fully assembled, this stove will only weigh about 73 grams. At just a glance the MSR MicroRocket camping stove looks incredibly similar to the frequently found MSR PocketRocket, but it is in fact much smaller and much lighter than the PocketRocket. This small stature is accomplished with ease as every piece of the MicroRocket camping stove folds together, resulting in a camping stove that is no bigger than the size of your palm. This compact nature means that the camping stove is ideal for a number of backcountry uses, and it takes up minimal space so it would not weigh you down the way a traditional camping stove would. The stove is relatively small and nice and made of steel, which makes it very durable. It is comprised of one central stalk and three fold-out legs for storage. This only gives it average stability, so you have to be careful when using larger pans. However, it would be ideal for people who enjoy hiking light. It is worth noting that using a pot too large on this particular camping stove would result in it toppling over, and it also needs to be placed on level ground otherwise your cookware will slide off! 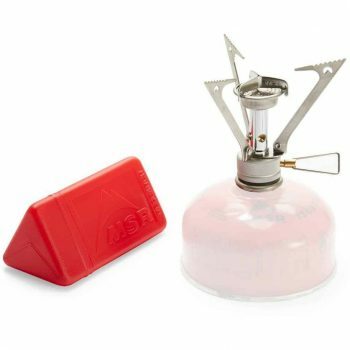 Just like a number of MSR products, this camping stove is known to last for years. It could be dropped or knocked over and it would still work, and out in the backcountry it is easy to drop your camping stove. One more thing worth mentioning is the design of the legs is very sharp – so if you’re not storing it in its plastic container, you may easily damage your other equipment. The most beneficial feature of this product is the fact that it is compact. It can easily be thrown directly into a daypack, or into the boot of a car, or even into a beach bag for quick and easy access. It is not the same as carrying around raw materials to start a fire, and it is often much safer. Image credit: adventuresinstoving.blogspot.com; The new Pocket Rocket 2, center. The original Pocket Rocket, right. At just 3.5 x 4 x 5 inches the product is tiny, and due to that it is also lightweight, weighing just 0.51 pounds. We often take lightweight products for granted while out hiking, and this product will quickly be the same. When it comes to camping stoves, wind resistance is an important factor that needs to be considered. The burner on this particular camping stove can resist wind speeds of up to 10mph, but if you are exposed to windier conditions than that then you should attempt to use the MSR MicroRocket Stove behind a form of barrier. However, this stove performs much better in windy conditions than many average stoves out there. The wind will probably push the flame, but it takes much more to extinguish it, and you will have boiling water in 2 minutes. Unfortunately, when wind barrier is needed, you cannot use this particular product with a conventional wind screen, so you might have to get a little bit creative when it comes to choosing your barrier. This camping stove has been designed to be as small as possible, and due to that some vital practicality has been lost in the process. You cannot use it with large pots and pans, and it doesn’t perform well on uneven ground. But, if you are using it for solo use on flat ground then it is perfect. It also features a larger than normal fuel valve, giving you more control over the flame that the camping stove produces. One thing that we have noticed during our own testing is that the metal area where you place your pot will glow red during use, although it does not show any sign of damage after cooling down. The MSR MicroRocket Stove is actually a lot more affordable than other camping stoves that are readily available on the market, and while the size of the MSR MicroRocket will not be suitable for everyone, it would be ideal for use by a single person. It is both durable and versatile, due to its small stature. It also comes with a free hand-held igniter that features a protected element within a fuel-gathering tube, resulting in reliable ignition. Add that to its ability to boil one liter of water in just a minute and a half, and you have yourself a great, little camping stove. If you are looking for a camping stove with an additional layer of practicality, then you should look no further than the close competitors of the MSR MicroRocket Stove. MSR believe in producing camping stoves that can be used in a variety of situations, and that is more than apparent in the features of their other products. One thing that makes the MSR WindPro II Stove ideal for use is the fact that it is strong enough to support pots of up to 10 inches in diameter, meaning that it can be used for multiple people at once. Unlike the MSR MicroRocket Stove that is really only suitable for single-person use. The WindPro II has been facing the wilderness of the backcountry head-on for years, and it is known for producing phenomenal results. The only downfall? While still being lightweight, it weighs much more than other camping stoves do. The MSR WindPro II is known for being highly durable, and it has the ability to last for years. It is also highly efficient when compared to other camping stoves, but it is simply not as small as other models that are readily available on the market. If you are looking to pack light, then it might not be suitable for your needs and requirements. But, it is frequently used by both backpackers and campers alike, and the inverted liquid-feed that it features delivers both increased cold-weather and low-fuel performance. This means that this camping stove could also be used by seasoned alpinists, due to its ability to handle cold weather scenarios. This product also comes with a windscreen that can be easily set-up to ensure that strong gusts of wind do not blow the flame out. You won’t have to seek your own barrier, instead you can set down and make some food, or boil some water immediately. 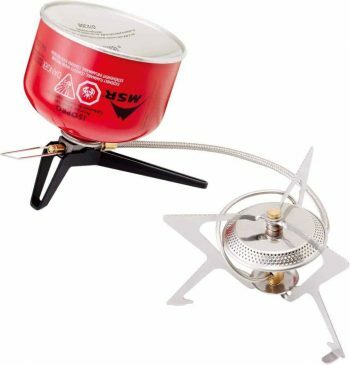 The MSR PocketRocket Stove is probably the best known camping stove that MSR manufacture, as it is one of the world’s most popular canister stoves. One of the best features of this particular camping stove is that it is known to produce an exceptional level of performance in bad weather, with the ability to handle moderate amounts of both wind and rain. It is small, simple, and incredibly durable. The downside? It is also slightly unstable. Unfortunately, the points of contact with the pot on the angled supports are only miniature, so stability is questionable. At only 4 x 4 x 2 inches you also cannot expect this particular camping stove to be able to hold large pots and pans, although it can boil one liter of water in under three and a half minutes. What this camping stove offers the average adventurer is ultralight performance at fantastic value, and it would be the ideal product for an adventurer who enjoys packing light. However, if you are willing to carry a slightly heavier stove then the WindPro II would be a better option in regards to durability. One thing that you rarely see in the world of backcountry based equipment is a lifetime guarantee, and for a good reason. Any product that you go adventuring with on a regular basis is going to end up getting dropped, based around, and exposed to bad weather conditions. Yet, the MSR SuperFly Stove is one of the few products that is durable enough to come with a lifetime warranty. Most of the hikers and campers that use this stove believe that it could actually last forever, as it simply is that durable. The MSR SuperFly is known to be strong, but it is not as efficient as other MSR camping stoves. It does not boil water as quickly, nor can it be used as easily. It is also much heavier than other products that are readily available on the market. But, this additional weight is what enables MSR to offer a lifetime guarantee with the product. It also features a larger than normal burner that provides wide flame distribution, resulting in evenly cooked food. The last thing you need is a burner that results in a hot spot and an area of burnt food. And there you have it, some of the closest stoves that is in close competition with the MSR MicroRocket. If you find that the MicroRocket is not working for you, we highly recommend that you check out these other stoves from MSR. It can be difficult to decide which camping stove is directly suitable for your own needs and requirements. So, to help we have two different pursuits where people regularly use camping stoves. That way we can show you which of out listed camping stoves we would pick, and why. That way you can get an idea of which product could be the ideal product for you! When packing lightweight for a solo-hike the key rule is that you do not want to take anything with you that could effectively slow you down. You also want to make sure that everything that you do take with you fits neatly into your pack, without taking up too much space. We would be inclined to take either an MSR MicroRocket Stove, or an MSR PocketRocket Stove. The MSR MicroRocket Stove offers the lightweight nature that is required, but it unfortunately loses some practicality and cannot be used with a windscreen. Whereas the MSR PocketRocket Stove is also lightweight, but offers a little bit more stability than the MSR MicroRocket Stove. If you plan on heading off on a hike as a pair of people, or as part of a larger group, then in our opinion it would be worth taking a camping stove like the MSR WindPro II Stove. The only downfall to this particular stove is that it is slightly heavier than other camping stoves, but that weight can be shared around if you are part of a larger group or family. Luckily it still quite small too, with dimensions of 4 x 6 x 9 inches. It just is not as small as other readily available camping stoves are, but it is worth the extra size for the efficiency that it offers. One additional benefit that this stove can offer to a group of people is that it can actually handle larger pots and pans, unlike smaller camping stoves. It can handle pans of up to 10” in diameter, meaning that you can cook more food, or boil more water at a quicker pace than you would be able to with a smaller camping stove. Weight: The MSR MicroRocket Stove is ultralight, weighing just 73g. Size: The MSR MicroRocket Stove is known for being exceptionally small, and it is the same size as your palm. Versatility: Due to the small stature of this product it is incredibly versatile, and can be used almost anywhere. Weight: Unfortunately, the lightweight nature of the MSR MicroRocket Stove means that it simply is not sturdy enough to be suitable for a lot of outdoor pursuits. Stability: Due to the small stature of this product it is only suitable for use on flat, completely even surfaces. You also have to be careful not to use a pot that is too big, otherwise the product will fall over. Get out, and get cooking! We understand that choosing the right camping stove can be difficult, as there really are certain features that suit one person that might not suit another. Our advice would always be to base your choice on your own requirements as an adventurer. If you want a lightweight product that will not weigh you down, then go with either the MicroRocket or the PocketRocket. All you have to do is look at the details in the review, for example the MRS Pocket Rocket Review, and you can see that the PocketRocket is lightweight and compact, but simply not as sturdy as larger models are. As backpackers, most of the time the products that we use have to be lightweight, but if you can afford to take on the extra weight then durable products will always hold out. The Pocket Rocket is small, lightweight and very portable. It can be used in three seasons in normal conditions, and it will deliver the best performance it can. It boils 1 liter of water for less than 4 minutes and it has better wind resistance than many similar stoves on the market. So have you used the MSR MicroRocket before? If that is the case, what are your experiences with it while backpacking? Be sure to let us know your thoughts in the comments section.